Daniel shares the values most integral to the KIND team in his interview with Dr. Woody in Fox Business News. Values such as authenticity, transparency, commitment to excellence and team spirit contribute to a positive work environment and KIND’s success. A brand is a promise, and that promise starts with authenticity. Many executives will pay lip service to the idea of authenticity and having a strong set of values only to fail in genuinely demonstrating them in the way they live and lead on a day-to-day basis. 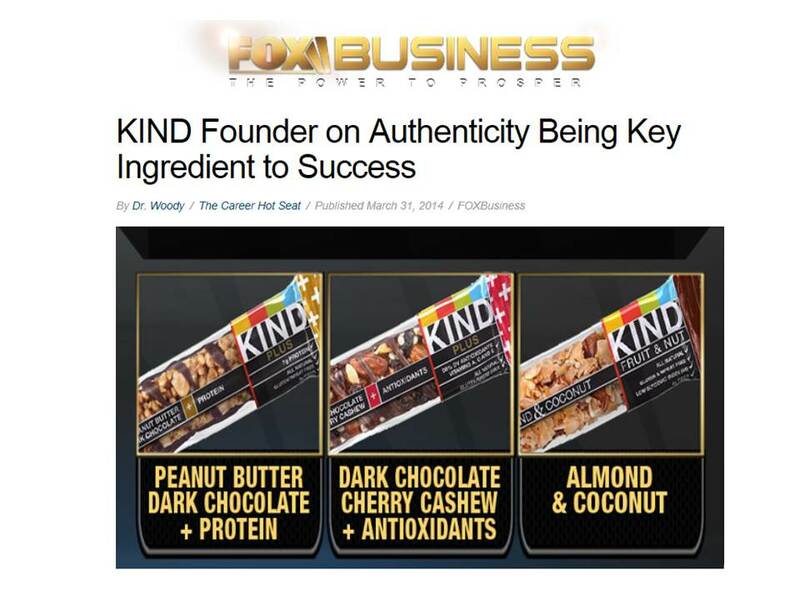 That is not the case with Daniel Lubetzky, founder and CEO of KIND Healthy Snacks. He identifies authenticity as one of the values that drives his personal and business life. To Lubetzky, KIND is more than just a name and a business; it’s a way of living. As the son of a Holocaust survivor, he learned at an early age the power of kindness and helping others, which is why the folks at KIND strive to make as much of a positive social impact as they do an economic one. Critical to their success is that they do it in an authentic way. Programs like the KIND Movement and Strong & KIND are genuine reflections of Lubetzky’s drive to make the world a better place. I had the pleasure of sitting down with Lubetzky at the annual EY Strategic Growth Forum to talk about the role authenticity and how his personal values play a role in his leadership. Below is a partial except, the entire interview can be seen here. Woody: As a founder, how have your personal values helped you in creating this organization? Lubetzky: Some of our core values are about transparency and authenticity, that’s not just in the product having a clear wrapper, but also the way we name our products with direct names. We don’t come up with cookie cutter a-la-mode names. We are very direct, [for example we use] Dark Chocolate Cherry Cashew, Dark Chocolate Nut and Sea Salt, or Almond Apricot. It’s a choice, a difficult choice because marketers always want to do some spin, but we chose that in a world of so much hoopla we wanted to be very direct. That applies also to our culture where we are very open internally with our team. We are very communicative and we even over communicate. It’s an expectation that if someone is not doing well the person they report to will explain that to them and give them a chance to adjust and work things out amongst themselves. It’s about building a family culture where team members understand we are all in this together, that we need to win together. There’s no office politics. The challenge is to continue achieving that while we grow. We are now 250 people, so how do you preserve those values of team spirit, kindness, and camaraderie. Woody: Two hundred and fifty people make a big family, so what are some of the things you do to preserve that family feeling? The most important this is to understand who you are, not just as a person, but as a company and what are your brand values, your brand promise, and make sure you understand what your unique selling proposition is and that you stay true to it no matter what. If there is a fad here, a trend there, or someone else is doing it differently just stay grounded and make sure you are yourself and make sure you are true today and tomorrow because if you keep that brand promise the consumers, your team, and everybody are going to understand what you stand for and this will help you answer all the questions along the journey.